"Art Now and Then" does not mean art occasionally. It means art NOW as opposed to art THEN. It means art in 2019 as compared to art many years ago...sometimes many, many, MANY years ago. It is an attempt to make that art relevant now, letting artists back then speak to us now in the hope that we may better understand them, and in so doing, better understand ourselves and the art produced today. 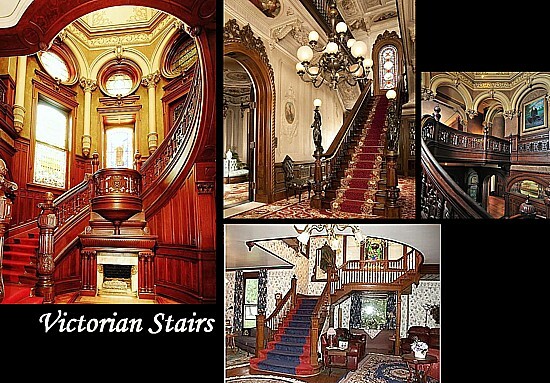 Victorian--heavy, dark wood, dark upholstery (often red) and an excess of machine-carved details. About a month ago I penned the second of several posts having to do with the historic development of interior design in the United States. I moved from Colonial to Early American in the first two items and this time I will attempt to cover Victorian interiors. I used the work "attempt" advisedly in that, inasmuch as Queen Victoria of England ruled from 1837 to 1901, that's one hell of a long period both in terms of world history and in the design tastes of her realm and ours. The fact is that it includes such design styles as Gothic Revival, Regency, Empire, Italianate, French Provincial, Arts and Crafts, and even Anglo-Japanese. As if all this wasn't bad enough, in trying to organize the design tastes of the Victorian era into some manageable whole, the word "eclectic" keeps coming up, meaning that very often all these individual influences got stirred together into an ungodly amalgamation that truly defies description and organization. It's little wonder that with the death of Queen Victoria and the ushering in of the pre-World War I Edwardian era, of staid, restrained, masculine simplicity, interior designers the world over breathed a collective sigh of relief. It was during this time that the seeds of the Modern Era were allowed to germinated and burst forth. in design tastes of the period. The reason interior designers of the Victorian era were so able to "mix and match" items of different style is that, until this period "interior decorators" as they were called then, were something of a rare breed, available only in big cities and to those with big bucks. Everyone else just looked through the Sears catalog or the window of some big department store and bought whatever struck their fancy with near total disregard for the overall impression to be made it dumping it all together. It's little wonder the Modern Art mantra, "less is more" came down the road when previous the byword had been, "more is not enough." Unfortunately, when buyers dictate their choices to present day designers, or simply ignore their availability, the latter phrase continues to dominate. And while few, (if any) modern day homeowners would opt to do their entire home in a Victorian style, there's still much the same tastes and thinking to be found in the cluttered, over-decorated, excesses of many living rooms today. I know. I grew up in such a morass. My mother thought she knew something about interior furnishings. Her tastes were nothing if not eclectic. Okay, let's start in the parlor. That translates to living room in today's vernacular, which is most appropriate in that there wasn't much "living" done in Victorian parlors lest someone break something or soil the upholstery. Kids played outside or simply "elsewhere." Even many adults of the time found their museum-like showplace unbearably stuffy, preferring instead the relaxed, breezy informality of the front porch (or the terrace, if you had two half-dollars to rub together). The various examples above depict the Gothic Revival influence (top-right) and some lingering Classical tastes. Draperies were heavy, dark, and often drawn. The concept of "privacy" was relatively new at the time and strictly enforced when possible. 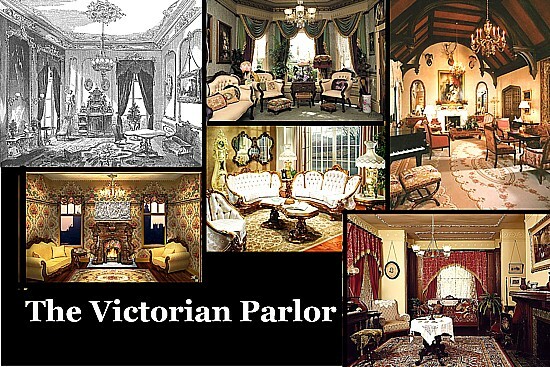 The parlor, more than any other room in the Victorian home, became a showplace for wealth and supposed good tastes. In fact, it was often neither in that few outsiders ever set foot in the place and good tastes were quite arbitrary. Hey, you, at the other end of the table, please pass the peas! 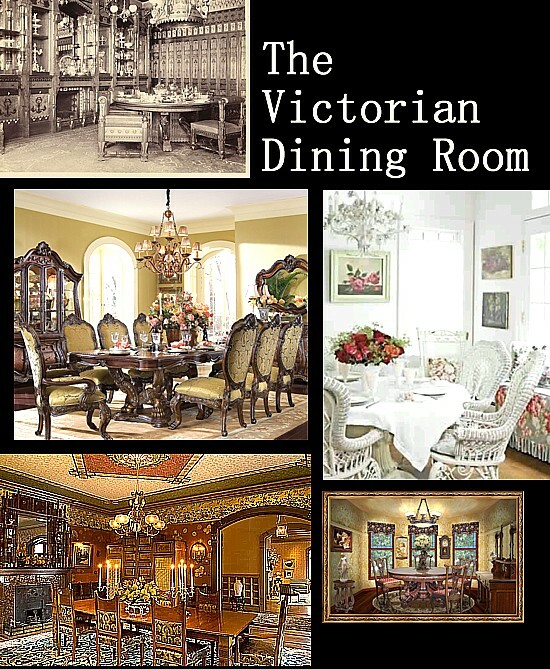 The dining room was every bit as heavy, dark, and formal as the parlor; so much so that in many households, it served as a room for dinner dining only. Victorians preferred the light, airy qualities of the "breakfast room" for the first, and often the second meal of the day (above-right). White wicker was very much in style." The custom of men pulling out chairs and helping to seat the ladies was very nearly a necessity. The damned chairs were so heavy some of the men had to struggle. Even adding little wheels (casters) to the feet of chairs didn't help much. They rolled too easily on bare hardwood, and barely at all on deep, Victorian carpets. In general, there was a direct correlation between the wealth of the family and the weight of the furniture. Furniture design during the Victorian period evolved from light and delicate English woodworking to the sculptural monumentality of the Italians. Carpets began to be woven by machines which could be "programmed" (in the most elementary sense) to repeat patterns endlessly, resulting in the florid florals floating freely across Victorian floors. 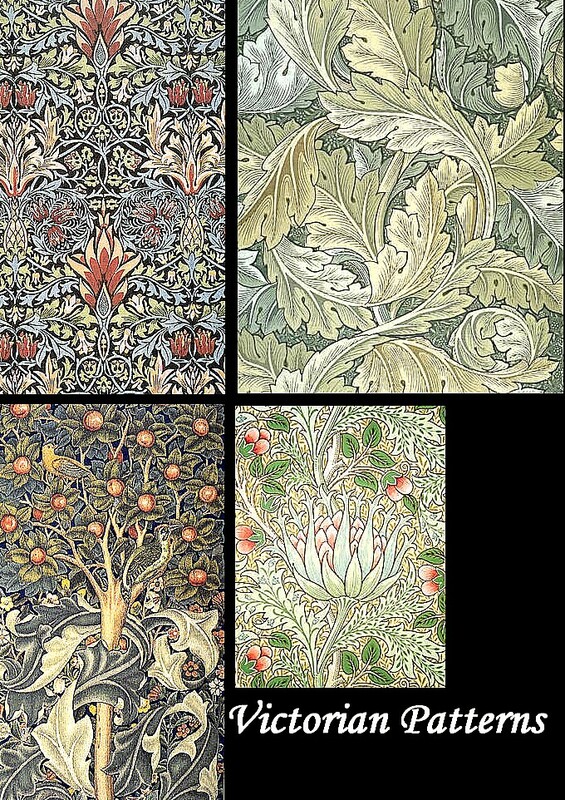 That was also much the case where fabrics and wallpaper were concerned as illustrated below. Not one square inch upon which to rest the eyes. For more than a century, the one room in the American home which had changed little was the kitchen. However, the lengthy two-thirds of a century marking the Victorian era, that room changed immensely as open fireplaces were replaced first with wood-burning stoves and then various natural gas "ranges" (I have no idea where that term came from). By the end of the Victorian era, the wealthy were even starting to outfit their kitchens with crude, ammonia refrigeration units (a gas leak could be deadly). Cupboards were outfitted with glass to better display the family china while tables evolved into counters with doors to hide everything else. Kitchens were seen as functional first, with barely a thought as to making them "beautiful." Nonetheless, by the latter years of the Victorian era, kitchens had evolved to the point that today, one can (with a few compromises) craft a relatively attractive kitchen featuring authentic Victorian influences (below, top-left). 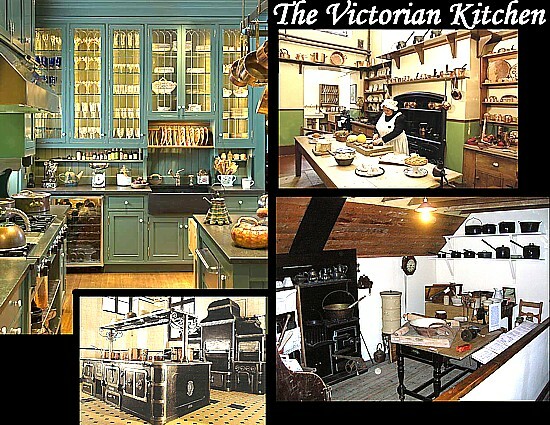 During the Victorian era, kitchens evolved from whitewashed Colonial (bottom-right) to the downright institutional "appliances" (bottom-left). 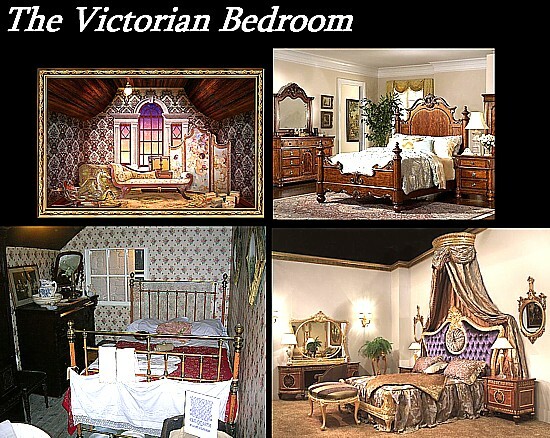 When we think of Victorian bedrooms, two images come to mind--the brass bed and the dark, heavily-carved mahogany, horizontal throne replete with heavy draperies swooping down from a regal crown near the ceiling. The earlier canopy beds lost favor as homes became easier to heat and the need to keep bugs and various vermin from dropping from the ceiling lessened. As with many other rooms in the Victorian home, heavily curtained darkness and privacy seemed to provide an essence of security. Perhaps more than any other room, style was dictated by family wealth, not for flaunting, but in providing a feeling of personal comfort and wellbeing. The Victorian style imitated great wealth (bottom-right). Modern Victorian incarnations (top-right) are an imitation of that imitation. During the Victorian era, for the first time, American homes began to acquired modern (more or less) indoor plumbing. If the Victorian kitchen was fundamentally functional, the newly minted "bath" room was all the more so. They were far from attractive in appearance. 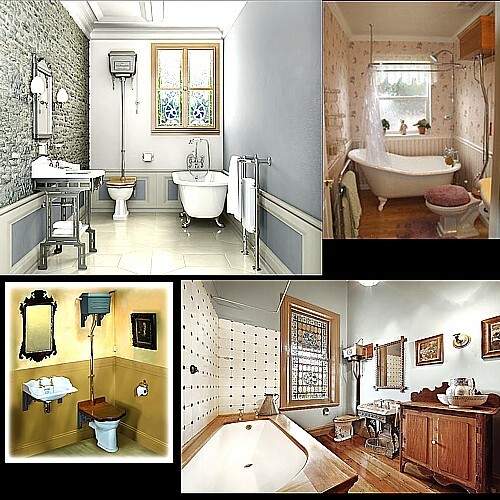 If someone tells you they have a beautiful Victorian bathroom you have my permission to laugh in their face. There was no such thing at least until well after WW I. Very often they were cramped, fitted into existing closets or under attic eaves. At best they were a small room partitioned off from a bedroom featuring a claw-footed, cast iron, porcelain tub, a simple pedestal sink, and the all-important "crapper" invented by that brilliant Englishman, Thomas Crapper (no joke). Floors were sometimes ceramic tile but more often simple hardwood like the rest of the house. Walls were enameled wood or plaster. Windows were non-existent or tiny. Inasmuch as there was seldom more than one such room per household, relaxing through a long, hot, lingering bath was mostly myth. You went in, locked the door, did your business, flushing once or twice, then got out so someone else in the family could do the same. The Victorian bathroom--form follows function. The Victorian bathroom was very much an anticlimax to the trek up the heavily ornamented Victorian stairways in getting to it. 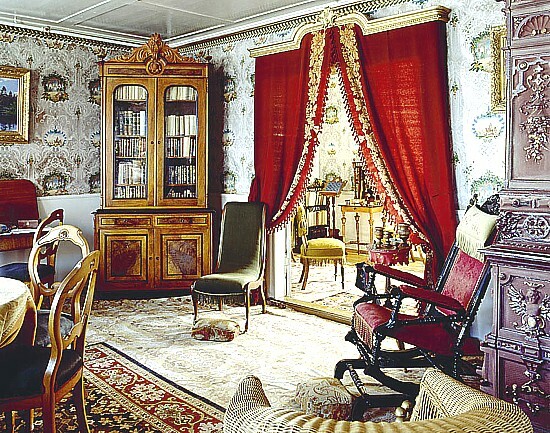 Nowhere else in the Victorian abode was ostentation so flagrantly and tastelessly displayed. The railing along the side was not so much for safety as an opportunity to display machine turned woodwork. 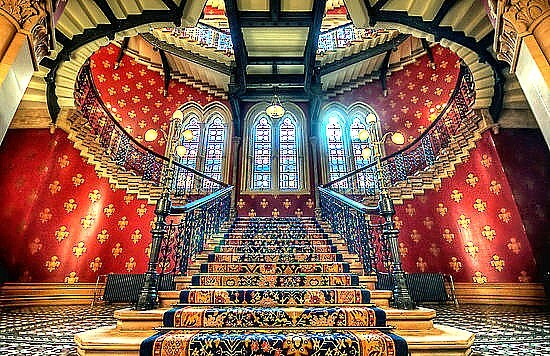 The longer the set of steps, the more gracious and impressive as ladies with their floor-length gown glided down them while men often dashed toward the top taking two or three steps at a time. Deep carpeting was a must in cushioning the fall if the lady of the house took a Scarlett O'Hara tumble to the bottom. Numerous "landings" no doubt got their name as a means of shortening the fall. Some Victorian stairs seem to us downright scandalous in their over-the-top ostentation. Although there was no digital revolution during the Victorian era allowing both husbands and wives to work outside the office, the home-office (or study) had been a mainstay of American homes for several generations even before Queen Victoria. Fathers were just as likely to bring back "homework" from the office as their offspring were from school. Businessmen-fathers needed a place of peace and quiet to work, read, study, and relax away from their noisy, obnoxious progeny. 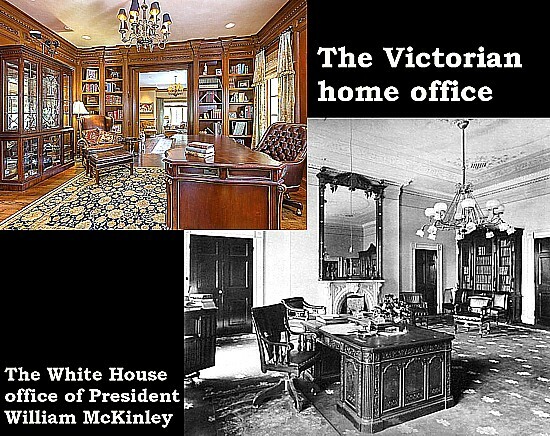 Even the White House had a home-office (below-right). Ladies had their "drawing" rooms. The man of the house had his study, den, or library. Speaking of the White House, I've shown some of the best and worst the Victorian era had to offer. 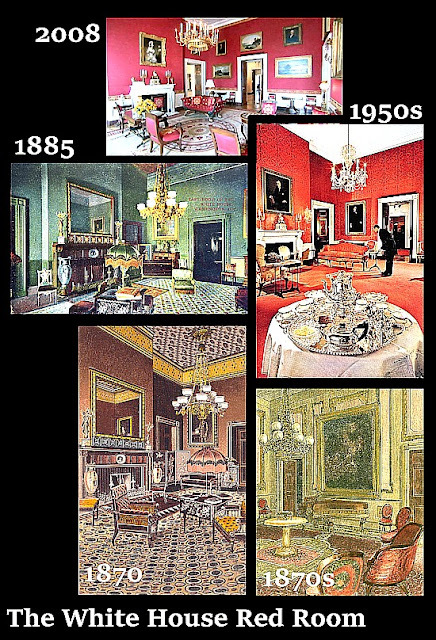 Now let me show you two rooms from the White House that, over the years, have become the gold standard for Victorian interiors--the Red Room and the Lincoln Bedroom. It's not surprising that the quintessential Victorian room in the White House should be done in red. Rich, dark, deep red was the one color most favored by Victorians. In the years following the early 1950s rebuilding of the White House, the story has it that President Truman called in an interior decorator from a local department store. It would seem, his Red Room (below-right) could use "a touch of red" here and there. Jackie Kennedy came to its rescue in 1962. 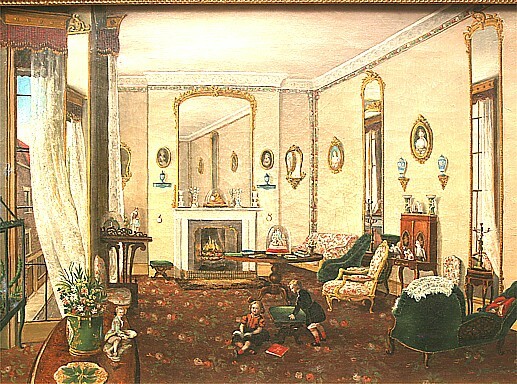 Her Red Room (just below) is virtually unchanged today. opposite side of the Blue Room are virtually indistinguishable in a black and white photo. That's not the case with Mrs. Kennedy's choice of décor for the Lincoln Bedroom, the other major Victorian room in the White House. Her room, while fairly authentic according to period photos, appears harsh and sparse, perhaps the way Lincoln would have liked it. (He never slept there, by the way.) The bed is his, though, specially built to accommodate his six-foot, four-inch height. Although the room has been a bedroom at least since the 1920s, and probably since the building of the West Wing, during Lincoln's time, it was, in fact, his office, the scene of many historic photos and paintings. 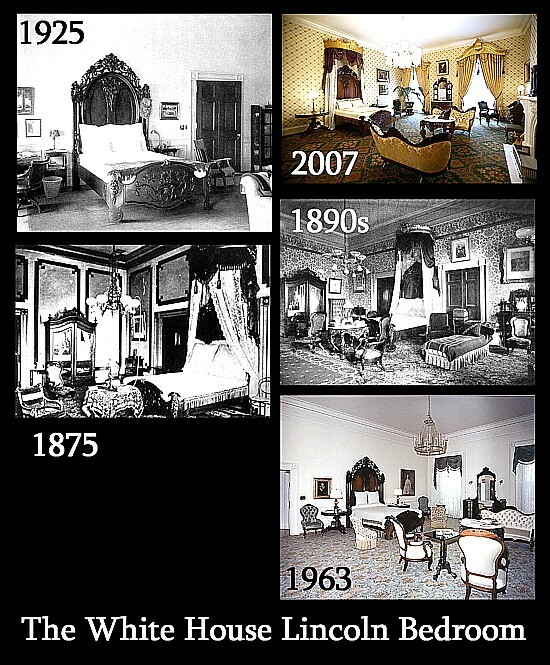 The current Lincoln Bedroom Victorian nbsp;(top-right) is somewhat more typically elaborate than Mrs. Kennedy's 1963 version of the room (bottom-right). Having grown up living amongst the lingering vestiges of the Victorian era (the furniture was really built to last), I can say quite truthfully Victorian styles are not a personal favorite. In our first home (a mobile home during my college years) I was a fervid devotee to furniture store modern. Later, I began to appreciate Italian Mediterranean stylings. In more recent years I've veered away from that to light, bright, simple, sleek, contemporary, so long as it's comfortably overstuffed. In closing, let me leave you with one of the most astounding (and humorous) examples of Victorian exuberance I've ever seen (below). Notice, the steps continue up to at least the third floor. How'd you like to have that just inside your front door? This makes Scarlett O'Hara's Victorian tastes seem tame. Each chapter of Art THINK contains from four to twenty-one relatively short essays on different aspects of learning to think like an artist. Originally written for an artists' online discussion group, these "ArtyFacts" (as they were first called) can be bitten off, chewed, and digested in as little as fifteen minutes. Some items are light and fluffy-brain candy. Some are snack food for thought. Some are downright chewy. And, a few are (gulp) stick-in-your-throat fruit-cakey. They employ humor, irony, a gentle dose of art history, common sense, conventional wisdom, and good old school-of-hard-knocks experience. All text content is copyrighted, please do not use in any form without written permission. Most photos, except those by the author, are in the public domain unless the artist is still living or died after 1949. Fine art appraisal, art prices - Search freeClick here: Free auction prices. Signatures and monograms. Most famous Paintings of all time. WahooArt museum offers hand painted fine art reproductions.